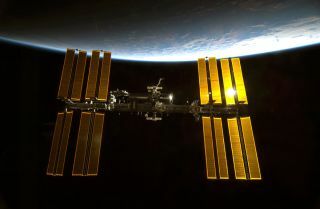 A veteran NASA space commander and Russian cosmonaut have signed on for the ultimate space voyage: a yearlong trip on the International Space Station. American astronaut Scott Kelly and Russian cosmonaut Mikhail Kornienko will launch on the one-year space station flight in spring 2015 and return to Earth in spring 2016, NASA officials announced today (Nov. 26). They will begin their mission training in early 2013. The mission will help NASA understand how the human body adapts to extremely long space missions, such as voyages around the moon, to an asteroid and ultimately to Mars, NASA officials said. Kelly, 48, is a U.S. Navy captain who has flown on two space shuttle missions and one long-duration expedition on the International Space Station. He commanded the space station's Expedition 26 mission in 2010 during his third spaceflight. Kelly hails from West Orange, N.J., and joined NASA's astronaut corps in 1996. His identical twin brother Mark Kelly also served as a Navy captain and NASA astronaut before retiring from the military and spaceflight in 2011. Kornienko, 52, is also a veteran spaceflyer. The native of Syzran in Russia's Kuibyshev region is a former paratrooper officer who joined Russia's cosmonaut corps in 1998. Kornienko spent more than 176 days in space as a flight engineer on the station's Expedition 23 and 24 crews. NASA and Russia announced plans for the one-year space station voyage earlier this year. Rumors of the flight were circling prior to the announcement, with the Russian news agency Interfax suggesting that veteran NASA astronaut Peggy Whitson —a veteran station commander —as a potential choice for the American crewmember. Whitson stepped down from her position as NASA's Chief Astronaut earlier this year to rejoin the agency's active spaceflying ranks. Today's announcement, however, puts that theory to rest. "Selection of the candidate for the one year mission was thorough and difficult due to the number of suitable candidates from the Cosmonaut corps," Vladimir Popovkin, the head of Russian Federal Space Agency, said in a statement. "We have chosen the most responsible, skilled and enthusiastic crew members to expand space exploration, and we have full confidence in them." Russian cosmonaut Mikhail Kornienko, Expedition 23 flight engineer, is pictured near fresh tomatoes floating freely in the Unity node of the International Space Station in May 2010. The 2015 space station flight by Kelly and Kornienko will be the longest mission to the International Space Station, but not the longest continuous spaceflight. That record is held by cosmonaut Valery Polyakov, who lived aboard Russia's Mir space station from January 1994 until March 1995, ultimately spending 438 consecutive days in orbit. The International Space Station is the product of cooperation by NASA, Russia and the space agencies of Europe, Japan and Canada. Construction of the $100 billion space station began in 1998 with the first crew taking up residence in 2000. Astronauts and cosmonauts have lived on the space station in rotating crews ever since.